Beauty spells...ever popular, cravingly desired and cherished! Although witches can often have a very poor stereotyped image of a gnarled old troll of a woman complete with warts and other awful distortions, nothing could in fact be further than the truth! As we all know, witches walk amongst us in every facet of life and especially as women primarily but also as a witch, do we not deserve to feel pretty, beautiful and desired? Beauty spells are used by many and are as old as vanity and femininity itself! Beauty spells have a variety of uses that range from becoming beautiful to holding on to that beauty once you have it. Spells to increase beauty also are intended for the inside as well as the outside! Here for you now, I have a selection of some of my most favourite beauty spells. I hope you enjoy them and they provide you with everything you need! This first one is very simple and aims to “work” on one particular body part or aspect at a time. This spell will require a mirror and also a picture of the feature you are trying to change about yourself. The picture should also be cut out. For example, if you are wanting to change your nose then the picture should only be of your nose. To complete this spell, once you have finished chanting, light a pink candle or some incense and you are done. Another of my beauty spells, this one is a great pick me up and should be used whenever you feel you need it. You will require sunflower and rosemary oils as well as a sprig of rosemary, a glass of spring water, some paper and a fountain pen containing red ink. Add 5 drops of the rosemary oil to 1oz of the sunflower oil. Stir together and then massage this mix into your hair. For a minute or two, close your eyes and simply inhale the scent, breathing deeply. Then, place the paper in the water and leave it in there until the ink has faded. Wash the oil mixture out of your hair, using the glass of spring water as the final rinse. To complete this ritual, wear the sprig of rosemary on your person for the rest of the day. OK then! A couple of cool beauty spells but what about protecting that newly acquired beauty? The final spell I want to share with you is directly from the pages of the amazing Witchcraft Exposed spells package and it relates to making sure you stay beautiful and youthful looking! I hope you enjoy these beauty spells and that they bring you everything you are looking for. It is our absolute right to be beautiful both inside and out and never let anyone try and take that away from you! If you liked the spells above, please look over the pages here at RealSpellsOfMagic.com for more great magic spells. 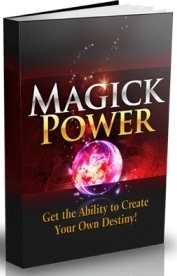 To really fill up your spell book or Book Of Shadows I totally can recommend Magick Power! It has so many wonderful spells and rituals as well as a magnificant understanding and explanation of all things Wicca and witchcraft! You can learn more about it including even more beauty spells by clicking the book below!